CET Films, a division of Nekoosa Coated Products, has introduced Clariguard™, a laser engravable polycarbonate film. 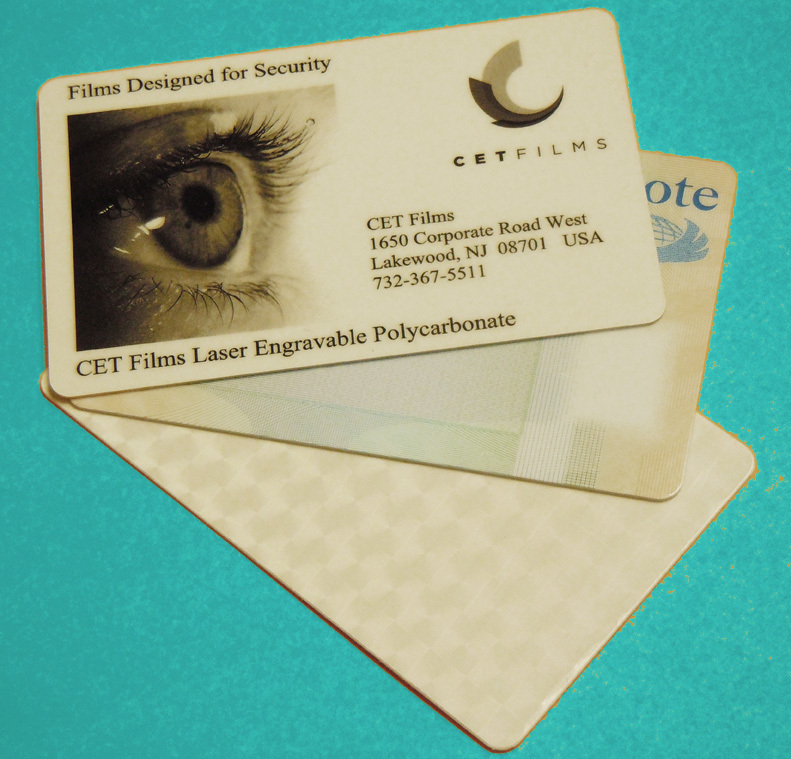 The new CET film provides a cost effective solution for producing tamper-proof security-sensitive documents. Clariguard™ incorporates a new non-carbon additive in the polycarbonate, which enables certain types of lasers to create a photographic image inside the film itself. Here’s how Clariguard™ works. To create a tamper-proof docu­ment, you only need a single sheet of CET’s new laser engravable polycarbonate. Clariguard™ incorporates a new non-carbon additive in the polycarbonate, which enables certain types of lasers to create a photographic image inside the film itself. As a laser beam exposes the film, it converts a proprietary non-carbon additive into black particles, producing a permanent image. Because the image is inside the film, rather than on the surface of the film, it cannot be tamper with. No additional material, inks, toners or foils are needed to laser engrave CET Films’ Clariguard™ polycarbonate. Nevertheless, Clariguard™ can be print­ed using offset or screen print processes. The unique non-carbon Clariguard™ formulation also improves production speeds, reducing manufacturing costs, in addition to produc­ing a higher-resolution, photographic quality image compared to other laser engravable films. Because the engraving of the image occurs inside the film itself, Clariguard™ is also a much more cost-effective and more secure alternative to multi-layer laminated security documents. Sensitive information is not sandwiched between multiple laminated overlays. Once the document is engraved, criminals cannot tamper with and alter the im­age. Sensitive security documents are safe and secure. And because Clariguard™ is made of durable polycarbonate, it can withstand thousands of flexes and provide up to 10 years of rigorous use. Laser engravable Clariguard™ films provide highly tamper-resistant personalization solutions for secure identification needs. The new CET film is perfect for producing Credit Cards, Passports, Machine Readable Travel Documents, Security Documents, Driver’s Licenses and ID Cards. While Clariguard™ can be used to manufacture single film security cards, the base stock polycarbonate film can also be permanently fused with other Clariguard™ films for composite cards. About CET Films Corp.: Founded in 1973 and headquartered in Lakewood, New Jersey, CET Films, manufactures cast custom extruded films for a range of niche graphic arts and ancillary markets. Resin capabilities include acrylics, PC, PVC and PETg. For more information on CET Films Corp. visit www.cetfilms.com.